Fergola, Salvatore. “Partenza di Pulcinella per la luna.” Between 1835 and 1849. Landauer Collection of Aeronautical Prints and Drawings. 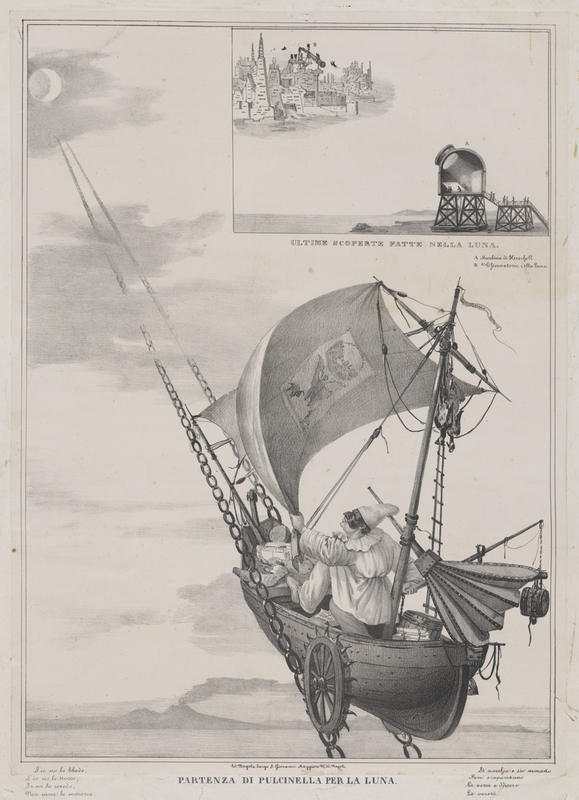 Summary: Print shows illustration relating to the Great Moon Hoax with Punch riding to the moon in a ship on a chain track; inset shows Herschel’s machine and moon observatory. Read the summary of the Lunar Narrative from the Museum of Hoaxes. What details from the articles do you see evidence of in this illustration? Why do you think the illustrator created an inset, or a picture within a picture? Access this .pdf to see the image in more detail. Compare and contrast the information about the Great Moon Hoax from the following sources. What did you learn? What similar information is presented? Are there any discrepancies?